Dr. Michael B Reynolds, DO is a Doctor primarily located in Brooksville, FL, with another office in Spring Hill, FL. He has 36 years of experience. His specialties include Family Medicine. He speaks English. Dr. Reynolds has received 2 awards. The overall average patient rating of Dr. Michael B Reynolds is Good. Dr. Michael B Reynolds has been rated by 18 patients. From those 18 patients 5 of those left a comment along with their rating. The overall rating for Dr. Michael B Reynolds is 3.2 of 5.0 stars. I never saw Dr. Reynolds (this was after waiting over a month to get an appointment), So I cannot comment on the quality of care someone might get from him. My comment is that after filling out a mountain of paper work, having my blood pressure taken, weight, etc. and sitting in the examining room giving the nurse my history while she documented it in her computer, the front desk lady came in and asked me questions about my insurance. She was cordial and the nurse in the examining room was very nice as well. But I had to leave because they weren't sure if they accepted my insurance or not. Although I'm officially retired, I do work part time and had to take off work for this appointment. I feel that insurance should be verified prior to scheduling an appointment. All it would have taken was a call to our insurance company if they had any questions. Again, I want to say the office staff couldn't have been nicer. Very pleased with Dr.Reynolds. He is very thorough and reviews every aspect of my blood work. He has kept me healthy in most part and has made suggestions as to what I need to change. I would recomend Dr.Reynolds to anyone in our area if they want a good internal medicine and family practice doctor. He is pleasant and courteous. In my personal opinion based on past experience I could not recommend this office to anyone. They misrepresented their services to me and took my money any way. they are about selling unnecessary tests with Physician Assistant over riding other doctors opinions. DO NOT WASTE YOUR MONEY WITH THESE PEOPLE!!! Look up the word "professional", youwill probably find the doctor's picture! 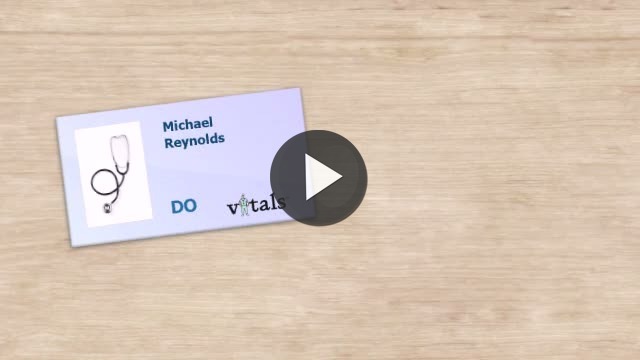 Take a minute to learn about Dr. Michael B Reynolds, DO - Family Medicine in Brooksville, FL, in this video. Dr. Michael B Reynolds is similar to the following 4 Doctors near Brooksville, FL. Have you had a recent visit with Dr. Michael B Reynolds? Select a star to let us know how it was.